Natal city centre, as seen from Natal’s oldest construction, the Forte dos Reis Magos – Magi King Fortress. Photo by Ben Tavener. Sun-soaked Natal is a well-oiled machine when it comes to welcoming and entertaining the two million or so Brazilians and foreign visitors who come to holiday here every year. The place comes with adventures of all sizes for the whole family to enjoy, all centred round the area’s blissful beaches and stunning sand dunes. The capital city of Rio Grande do Norte state in Brazil’s northeast region, Brazilians have made Natal a holiday and, along with Fernando de Noronha, a honeymoon destination that is pretty hard to rival elsewhere in the country. Sure, you’ll see the Cariocas, Paulistas and Italians with their designer sunglasses mincing around, but they soon just melt into Natal’s beautiful backdrop. Named Natal (“Christmas”) after its foundation on 25 December 1599, the references to the Three Wise Men and wandering stars seem a bit out of place in the 30°C heat for someone from Europe or the States. Although this is a place you could easily come to for a week or two’s paddling in the sea, feasting on sumptuous seafood and fresh coconut water, and then stretching out in a hammock, Natal – dubbed A Cidade das Dunas, the City of the Dunes – has plenty for those looking for adventure. 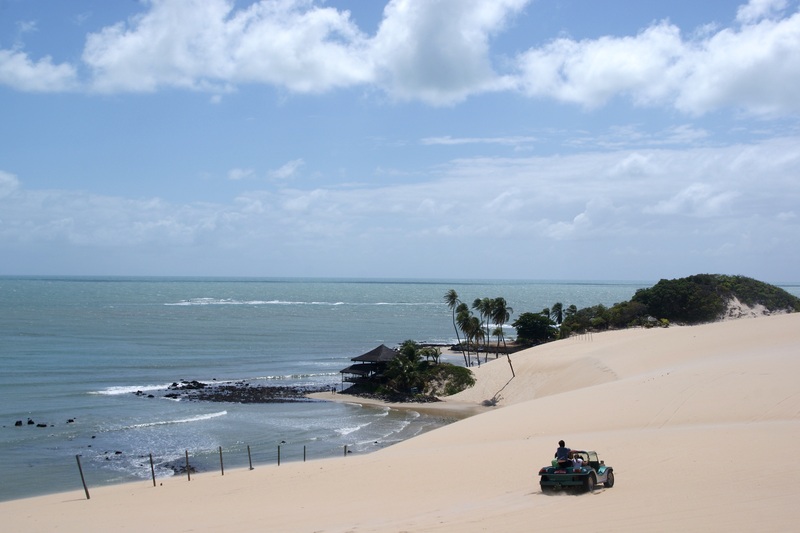 Sand buggies whisk you away from urban life to Natal’s famous dunes and lagoons, starting here in glorious Genipabu. Photo by Ben Tavener. 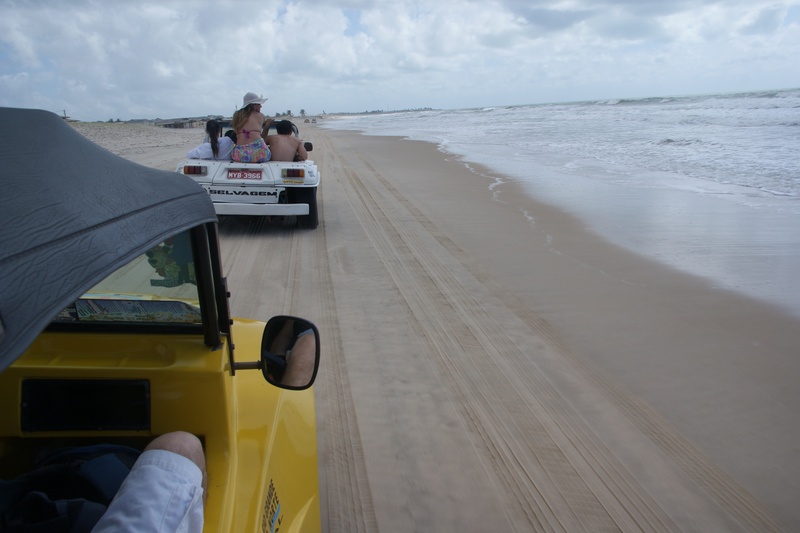 Dune buggying is almost certainly going to be one of your first ports of call, and is a must-do for anyone visiting the city to get an understanding of the area’s fascinating sand dune and lagoon systems. 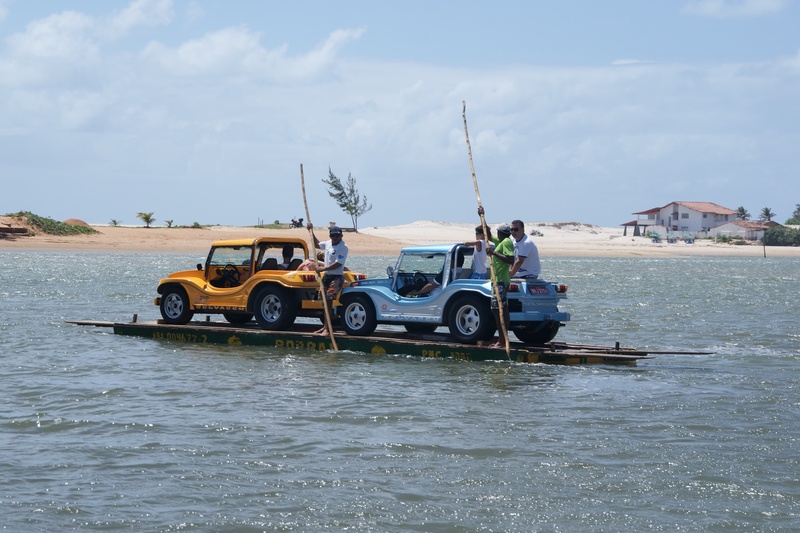 Typically starting in Natal’s upmarket Ponta Negra district – home to an slew of hotels, pousadas and restaurants – the buggy tour takes you through Natal and over the Potengi River and on to the main dune area, starting with Genipabu. Once you leave the road and start speeding over the dunes, you might be asked whether you want the bugueiro (buggy driver) to drive com emoção (“with emotion”) with fast twists and turns and seemingly near-vertical drops down the dunes, or sem emoção (“without emotion”) for the more faint-of-heart. Ski-bunda (eski-, esqui-bunda) means throwing yourself down a sand dune on a toboggan into a lagoon. Very refreshing it was, too! Photo by Ben Tavener. The buggies travel over the dunes, between a number of lagoons, along various beaches and through small villages (nearly always avoiding the roads) to a range of unmissable Kodak moments. 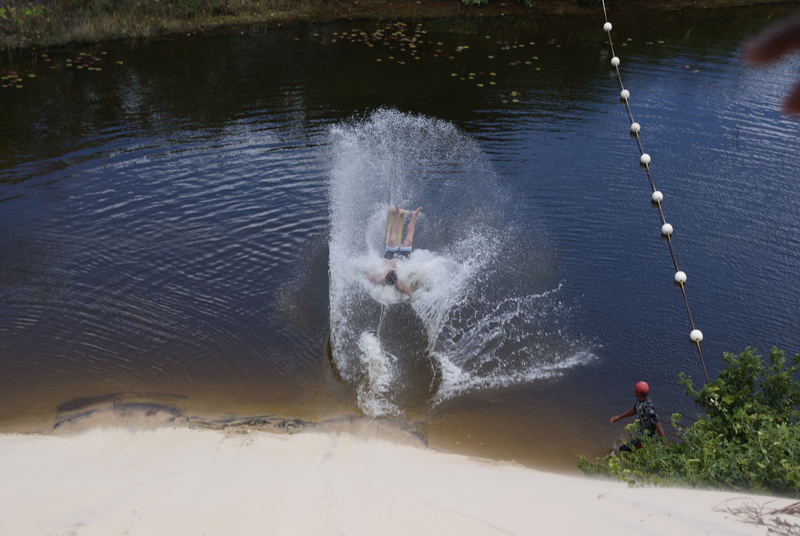 However, after the thrills come the spills: ski-bunda – literally “skiing on your bum” – which entails tobogganing down the sand dune from a height straight into the cool, dark waters of a lagoon below. It’s really fun – and the rickety motor-mounted bench contraption that zooms you back up the dune is an experience in itself. 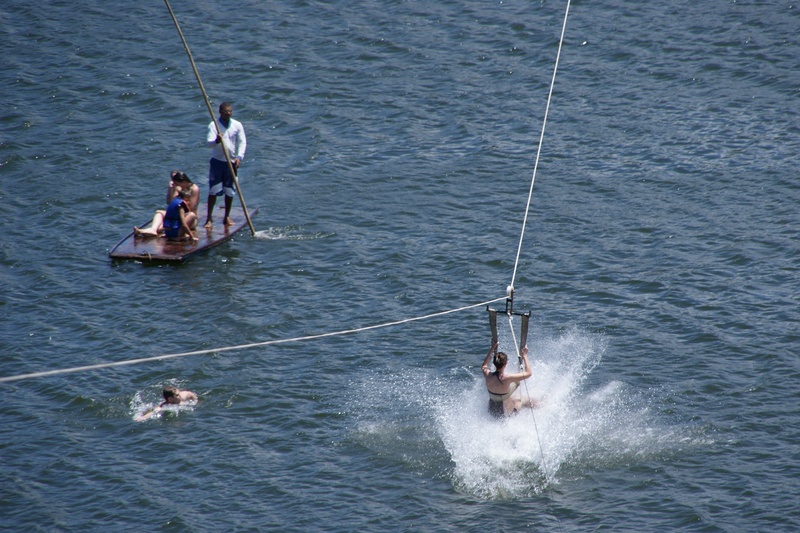 But it’s nothing compared to aero-bunda – literally “aero-bum” – starts off up at the top of a much higher dune, get into a sling which is attached to a zipwire, and then, traditionally with arms extended like the wings of a bird, splashdown into the lagoon. Splashdown! 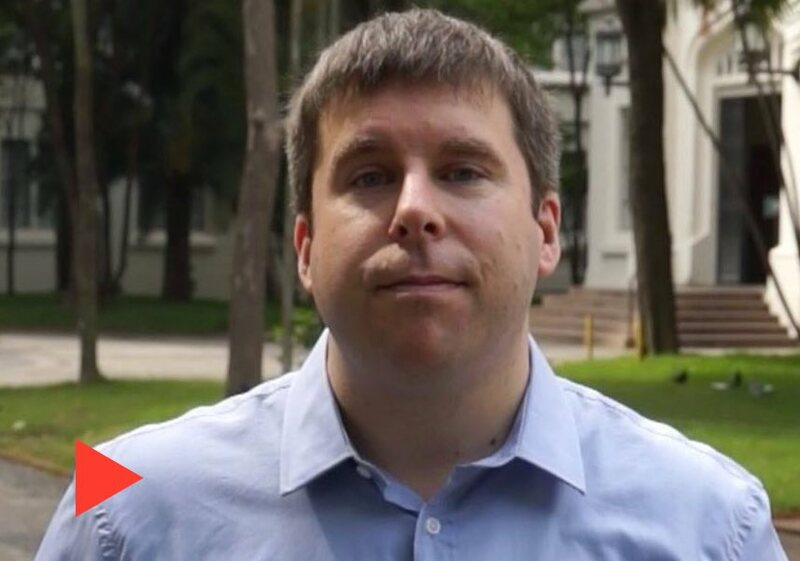 Aero-bunda is well worth the R$10. Photo by Ben Tavener. You’re then ferried back to terra firma and a similar motorised bench contraption whizzes you back up the dune. Both are perfect for cooling off after racing around the sun-baked dunes and will set you back about R$10 a go, and a team of photographers will be waiting to capture your slash-landing. Yes, these places are designed to take your money off you – and drinks and snacks are available everywhere for a slightly bumped-up price. It sounds touristy – and it is to an extent, but it’s enjoyable nonetheless. After the high-octane stuff, you will be taken to a beach restaurant for lunch with plenty of time for a dip in the sea, before being whisked along the beaches back to Natal. The dune buggying trip will most likely take you around the extraordinarily beautiful Genipabu. Photo by Ben Tavener. One thing should be very clear. Natal does not lack dune buggies. Travel agencies in Natal always have buggy days-out available – most leaving at between 8am and 9am – but people might come up to you on the street to offer their services. Make sure they’re licensed, if you can, and try to haggle a price – if you can fit the buggy, your chances are obviously much better. See my video on sand buggying, ski- and aero-bunda. Dune buggies can deal with little rivers, but sometimes need a helping hand from a puntsman – here crossing a river near Genipabu. Photo by Ben Tavener. The beaches around Natal are extraordinarily beautiful – and daytrips to villages, such as Gringo favorite Pipa, are easy to find and book in Natal. One of these goes to Maracajaú, a village to the north of Natal, which offers trips to go snorkelling and scuba-diving around the coral reefs a few miles out to sea. Snorkelling on the coral reefs is a fantastic opportunity for the whole family to get up close and personal with fish and rays. Photo by Ben Tavener. See my video. These generally cost around R$50 per person, and are well worth it. Don’t worry your camera isn’t waterproof (although taking one is a great idea if you can), underwater photographers are on standby to make your coral reef adventure a memorable one. 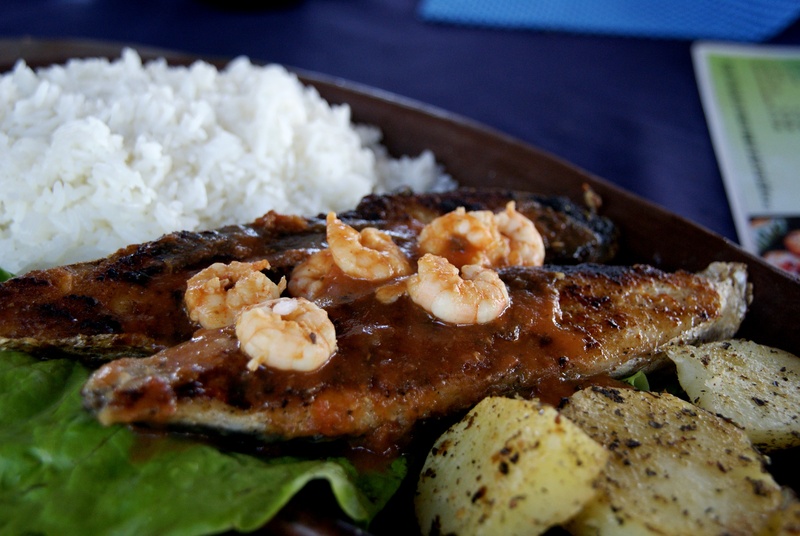 Lots of restaurants in the area serve great seafood – including serra (frigate-tuna) and various prawn/shrimp dishes. Don’t leave Natal without trying a rodízio de camarão (where they serve a number of prawn/shrimp-based dishes for a set price – normally around R$50 each) and having that quintessential picture taken in front of the famous Morro do Careca dune in the city’s upmarket Ponta Negra region. 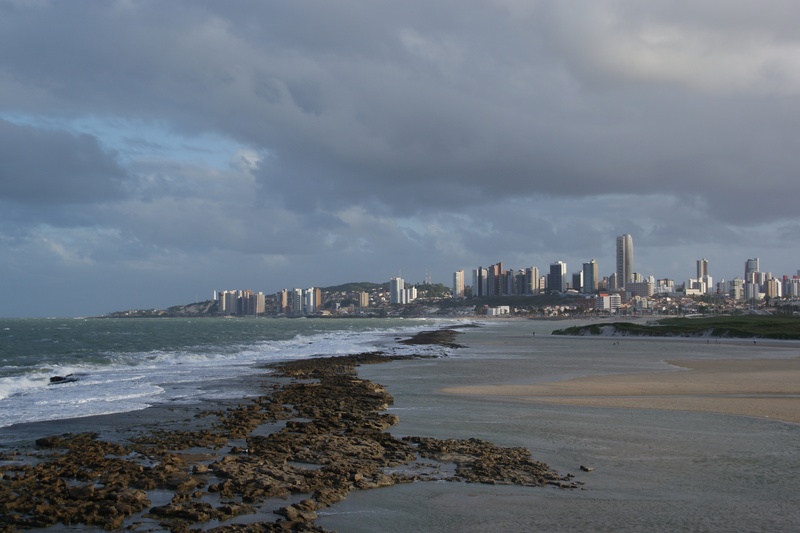 Although precautions should always be taken, Natal is Brazil’s safest capital city and has a good reputation among tourists. 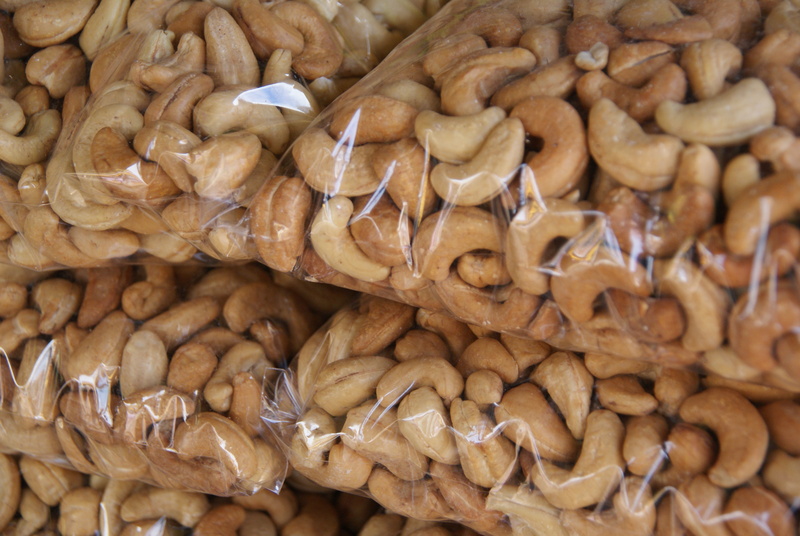 Natal is famous for its cashew nuts, of which there are more incarnations than you were probably aware. Photo by Ben Tavener. You can always find bargains in this city, so it is always worth shopping around, particularly with days-out, restaurants and if you want to buy local cashew nuts – after all, a small village outside Natal, which is easy to visit, has the world’s biggest cashew tree! What looks like an entire park is, in fact, one big mess of roots and branches all stemming from one trunk. Also nicknamed A Cidade do Sol, The City of Sun, Natal enjoys hot weather throughout the year, with daily temperatures rarely dipping far below 30°C, but as the city juts out, it is blessed with a cooling Atlantic breeze. This beautifully-grilled serra or frigate-tuna came garnished with prawns/shrimps, potatoes and rice and served two, costing R$40 (£12, $20). Photo by Ben Tavener. As with all tropical regions, the area has a rainy season – normally March through July, although locals say these showers are usually short and sharp. Flights to Natal’s Augusto Severo International Airport are available from most major airports in Brazil, including Rio and São Paulo, although some will involve a layover in Salvador. We found that prices varied wildly (we saw between R$450 and R$1200+), so pick your dates carefully and be ready to take advantage of special deals from the airlines. 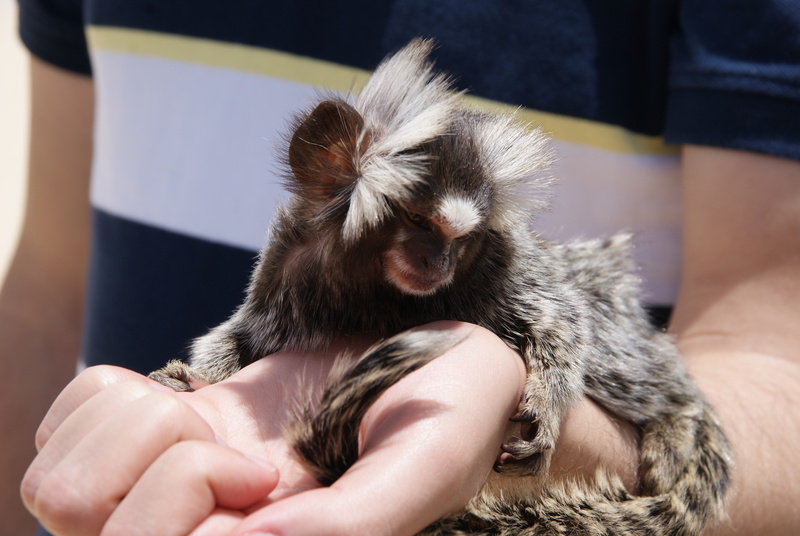 These “mico” tamarins can be found in and around Natal, and you can pose with one at one of the stops on the dune buggying day-out. 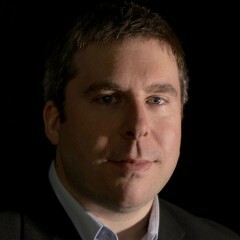 Photo by Ben Tavener. As part of our trip to Natal, Rio Grande do Norte in Brazil’s blissfully beach-packed northeast region, we went snorkelling on a coral reef. 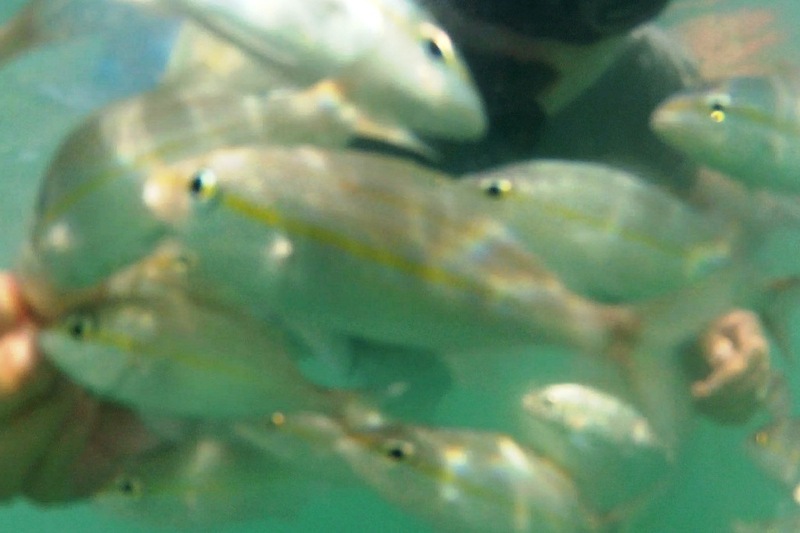 The reef is located some 7km out in the Atlantic Ocean off the seaside town of Maracajaú. Using our new GoPro Hero 2 camera, capable of filming up to 60m below the surface, we filmed what we could – despite the sea being very choppy and quite bubbly! Music – Under the Sea by Bena Lobo. Natal in Rio Grande do Norte state in north-east Brazil is the City of Sun. Surrounded by dunes, it makes an excellent location for sand buggying “com emoção” (which should translate as “fast and furious”) around the sandy hills, where you can zipwire into a cool lagoon or just relax and drink some coconut water. 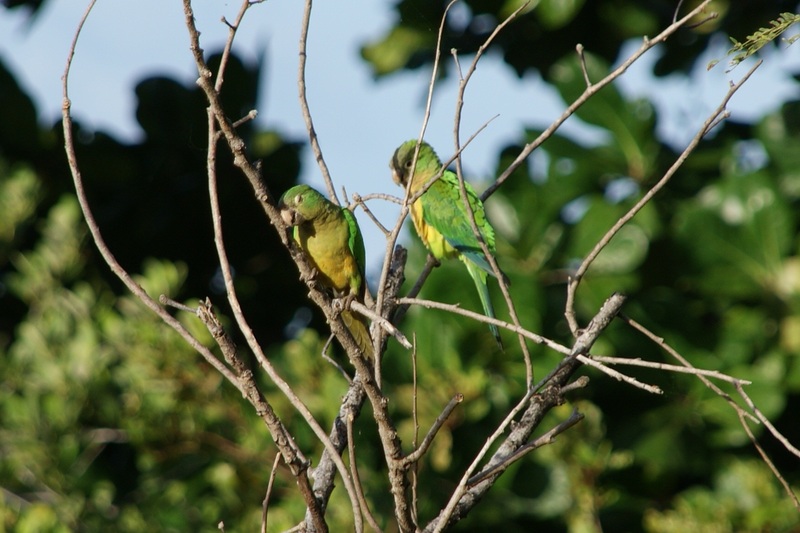 In this video we travel from Genipabu (Jenipabu) to Jacumã via nine beaches and four lagoons. A full blog on the trip is coming soon. Music – various forró songs from the region.